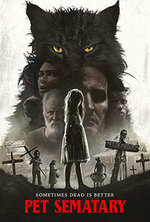 Louis Creed, his wife Rachel and their two children Gage and Ellie move to a rural home where they are welcomed and enlightened about the eerie 'Pet Sematary' located near their home. After the tragedy of their cat being killed by a truck, Louis resorts to burying it in the mysterious pet cemetery, which proves that sometimes dead is better. © Mission Tiki Drive In Theatre. All Rights Reserved.